Calling all video hot sauce reviewers and aspiring video directors. According to Poptent.net, a community of filmmakers, Cholula is sponsoring a video contest and will pay the winner $7500. The contest began November 16th, 2010 and ends January 10, 2011. Cholula is looking for a video, up to 60 seconds in length for use online. The goals are to create an even stronger bond between current users as well as to build awareness and drive purchase intent among new category entrants and competitive hot sauce users for all four flavor varieties, Original, Chili-Garlic, Chili-Lime and Chipotle. A major identifier of the brand is the iconic wooden cap. Consumers often say “Oh yeah, the hot sauce with the wooden cap”. Your video should be informal, energetic and fun. It should be real, emulating the brands positioning – premium, authentic and memorable. Keep in mind that the video should be suitable to family viewing, so make it full of flavor, but not SPICY. Stay away from overt Mexican themes, so no sombreros or maracas or Mexican music. It’s just too obvious. Cholula chooses the winning video for the $7500 prize and Poptent will award five Editors’ Choice awards totaling $2,000. Poptent.net has all the details here. I’m hoping to see one of our hot sauce community friends entering and winning this contest! Good luck! 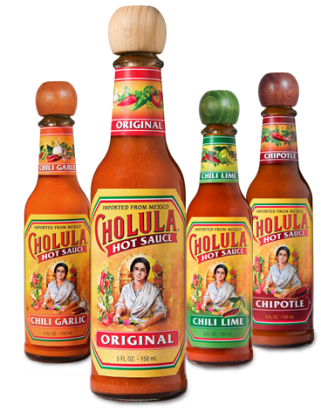 Cholula is my preferred “off the shelf” brand of hot sauce. Sixty seconds is a very brief video so it will be tough to get once edited down but I might give it a go.